We offer trailer hire in Wales and the bordering areas. Our cold storage facilities will keep you wine, champagne, beer or food chilled where and when you need it. We now have a new fridge and freezer trailer with shelving, which is available 24hrs a day. For more information about hiring our trailer, or to make an enquiry. Our fridge and freezer trailers are perfect for outside catering events and bars, or any other establishment that requires temporary or emergency refrigeration. Our refrigerated and freezer trailers are also available for emergency hire in the event of a commercial walk in chiller or cold-room breakdown, and we are available 24 hours a day, 7 days a week. 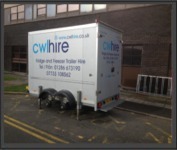 Trailers are available for short or long term hire, even if it is just while you await repair. For contacting us please use our contact page or the email and phone info below.